We purchased Jambo at the NDGA Nationals in 2010 to introduce new genetics into our herd. He has done a great job and his daughter Rue took Junior Grand Champion at the Illinois State Fair and Aria received a Reserve Grand Senior Doe. We retained 4 of his doelings and they have all placed in the top 3 of their classes at shows. He is putting some excellent udders on our first fresheners. 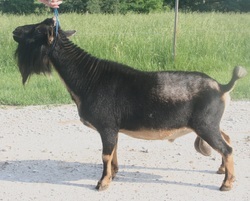 See the for sale page for details on his sale.